Bay Village native Patricia Heaton is best known for her acting roles ("Everybody Loves Raymond," "The Middle," a new series coming this fall called "Carol's Second Act") and now she has published a book of her favorite recipes. "Food for Family and Friends: 100 Favorite Recipes for a Busy, Happy Life" draws on Patricia's roots of growing up in Ohio. Her mother cooked simple, good food like meatloaf and pot roast. Having raised four sons, Heaton is a fan of budget-friendly recipes like the ones she grew up with. 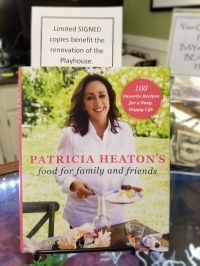 Signed copies of the cookbook are available for holiday gift-giving at BAYarts and will benefit the renovation of the former Huntington Playhouse, a place close to Patricia's heart. Heaton got the acting bug growing up in Bay Village and performing at the Playhouse. Hopefully, she will grace the renovated stage in the future. In the meantime, she is the honorary chair of the fundraising campaign and, along with her husband, actor David Hunt, made the initial gift of $50,000 to kick off the campaign. This spring she will be the special guest at "Encore 2," a fundraising event for the playhouse completion (date to be announced). A limited number of copies of "Food for Family and Friends" are still available. “People around Cleveland love Patty and they love cooking, what better holiday gift is there?" says BAYarts board president Mary Conway Sullivan. "We couldn't be more grateful to have her behind this campaign." The BAYarts shop is open seven days a week until Christmas. Hours are Monday-Saturday, 9 a.m. to 5 p.m.; Sunday, noon to 5 p.m.; Thursday until 8 p.m. Visit bayarts.net for more details. Jessica Stockdale is the Marketing Manager at BAYarts. BAYarts is a cultural arts campus that features education, exhibition and events.